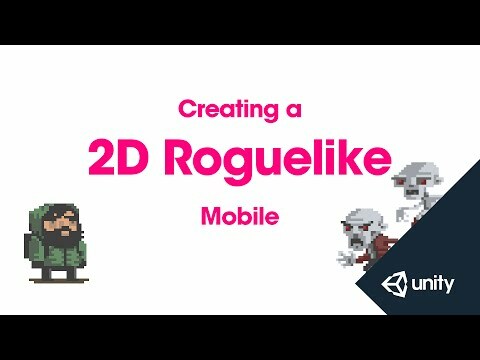 This is part 14 of 14 of the 2D Roguelike tutorial in which we add mobile touch screen controls to our player script. to our Player script to handle touch screen input. With that done we can close our build settings. And we're going to open our Player script in Monodevelop. is a private vector2 called touchOrigin. started touching our touch screen. which is going to be a position off the screen. add the mobile input code. the keyboard controls that we've been using thus far. including iOS, Android, Windows Phone 8, etcetera. a single finger swiping in the cardinal directions. the beginning of a touch on the screen. is greater than or equal to 0.
it to when we declared it, and that it has ended. and therefore we can get a direction to move in. We're going to do the same on the Y.
doesn't repeatedly evaluate to true. or generally more vertical in a given direction. and checking if X was greater than Y.
the user is trying to swipe in. vertical to equal 1 or -1.
at the end of our mobile code. are instead being set in our touch screen code using swipes. and parse in horizontal and vertical. or build to your touch device of choice. first if statement, if Unity_Editor. and you should be able to test your game in the editor. and I hope this was helpful for you. using UnityEngine.UI;   //Allows us to use UI. //Player inherits from MovingObject, our base class for objects that can move, Enemy also inherits from this. public float restartLevelDelay = 1f;        //Delay time in seconds to restart level. public int pointsPerFood = 10;              //Number of points to add to player food points when picking up a food object. public int pointsPerSoda = 20;              //Number of points to add to player food points when picking up a soda object. public int wallDamage = 1;                  //How much damage a player does to a wall when chopping it. public Text foodText;                       //UI Text to display current player food total. public AudioClip moveSound1;                //1 of 2 Audio clips to play when player moves. public AudioClip moveSound2;                //2 of 2 Audio clips to play when player moves. public AudioClip eatSound1;                 //1 of 2 Audio clips to play when player collects a food object. public AudioClip eatSound2;                 //2 of 2 Audio clips to play when player collects a food object. public AudioClip drinkSound1;               //1 of 2 Audio clips to play when player collects a soda object. public AudioClip drinkSound2;               //2 of 2 Audio clips to play when player collects a soda object. public AudioClip gameOverSound;             //Audio clip to play when player dies. private Animator animator;                  //Used to store a reference to the Player's animator component. private int food;                           //Used to store player food points total during level. private Vector2 touchOrigin = -Vector2.one; //Used to store location of screen touch origin for mobile controls. //Get the current food point total stored in GameManager.instance between levels. //Set the foodText to reflect the current player food total. //Call the Start function of the MovingObject base class. //This function is called when the behaviour becomes disabled or inactive. //When Player object is disabled, store the current local food total in the GameManager so it can be re-loaded in next level. //If it's not the player's turn, exit the function. int horizontal = 0;     //Used to store the horizontal move direction. int vertical = 0;       //Used to store the vertical move direction. //Check if we are running either in the Unity editor or in a standalone build. //Check if moving horizontally, if so set vertical to zero. //Store the first touch detected. //Calculate the difference between the beginning and end of the touch on the x axis. //Calculate the difference between the beginning and end of the touch on the y axis. //Set touchOrigin.x to -1 so that our else if statement will evaluate false and not repeat immediately. //Check if the difference along the x axis is greater than the difference along the y axis. //Pass in horizontal and vertical as parameters to specify the direction to move Player in. //AttemptMove takes a generic parameter T which for Player will be of the type Wall, it also takes integers for x and y direction to move in. //Every time player moves, subtract from food points total. //Update food text display to reflect current score. //Call the AttemptMove method of the base class, passing in the component T (in this case Wall) and x and y direction to move. //Hit allows us to reference the result of the Linecast done in Move. //If Move returns true, meaning Player was able to move into an empty space. //Call RandomizeSfx of SoundManager to play the move sound, passing in two audio clips to choose from. //Since the player has moved and lost food points, check if the game has ended. //Set the playersTurn boolean of GameManager to false now that players turn is over. //OnCantMove overrides the abstract function OnCantMove in MovingObject. //It takes a generic parameter T which in the case of Player is a Wall which the player can attack and destroy. //Set hitWall to equal the component passed in as a parameter. //Call the DamageWall function of the Wall we are hitting. //Set the attack trigger of the player's animation controller in order to play the player's attack animation. //OnTriggerEnter2D is sent when another object enters a trigger collider attached to this object (2D physics only). //Check if the tag of the trigger collided with is Exit. //Invoke the Restart function to start the next level with a delay of restartLevelDelay (default 1 second). //Disable the player object since level is over. //Check if the tag of the trigger collided with is Food. //Add pointsPerFood to the players current food total. //Call the RandomizeSfx function of SoundManager and pass in two eating sounds to choose between to play the eating sound effect. //Disable the food object the player collided with. //Check if the tag of the trigger collided with is Soda. //Call the RandomizeSfx function of SoundManager and pass in two drinking sounds to choose between to play the drinking sound effect. //Disable the soda object the player collided with. //Restart reloads the scene when called. //Load the last scene loaded, in this case Main, the only scene in the game. //LoseFood is called when an enemy attacks the player. //It takes a parameter loss which specifies how many points to lose. //Set the trigger for the player animator to transition to the playerHit animation. //Subtract lost food points from the players total. //Update the food display with the new total. //Check to see if game has ended. //CheckIfGameOver checks if the player is out of food points and if so, ends the game. //Check if food point total is less than or equal to zero. //Call the PlaySingle function of SoundManager and pass it the gameOverSound as the audio clip to play. //Call the GameOver function of GameManager.